The ENCJ General Assembly met 11-13 June in Rome to celebrate its 10th anniversary. The formal establishment of the network was done in Rome in May 2004. The 10th annniversary celebrations kicked-off with a reception at the Quirinale Palace hosted by the President of the Republic of Italy, Mr Napolitano, who is also the President of the Consiglio Superiore della Magistratura. All former Presidents of the ENCJ were also present and addressed the General Assembly. On 11 June 2014 the General Assembly of the ENCJ elected the next President and the members of the Executive Board. Geoffrey Vos, member of the Judges´ Council of England and Wales was elected President for a term of 18 months, starting on 1 January 2015. The ENCJ will gather 11-13 June in Rome to celebrate its 10th anniversary. The celebrations will be kicked-off with a reception in the Quirinale Palace hosted by the President of the Italian Republic, Mr Napolitano, who also presides the Consiglio Superiore della Magistratura. Throughout the two days of the General Assembly the reports of the ENCJ projects will be presented, discussed and adopted. Furthermore the ENCJ 2014-2018 work plan will be discussed and a Rome Declaration will be adopted. The Council of Europe published its first report on the state of democracy, human rights and the rule of law in Europe. On Monday 17 March the European Commission published the 2014 EU Justice Scoreboard. It brings together data concerning the efficiency, quality and independence of the Justice systems of the EU Member States. 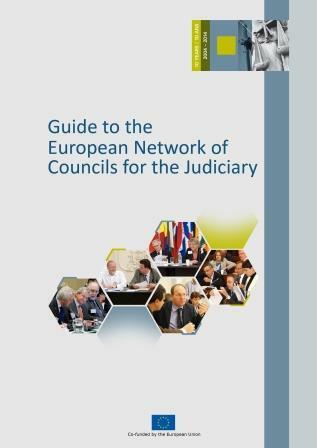 The ENCJ, through its members, has worked with the Commission on the 2014 EU Justice Scorebard by collecting information on the legal protection of judicial independence in Member States. The European Commission published two communications on 11 March 2014. The first communication sets out the vision of the Commission for the future EU Justice policy which aims at further progressing towards a fully functioning common European area of justice based on trust, mobility and growth by 2020. Judge Teresa Flemming-Kulesza, member of the ENCJ Executive Board between 2008-2010 and former member of the National Council of the Judiciary (2002 -2010) was appointed to the position of President of the Supreme Court on 21 January 2014. She will be heading the Labour Law, Social Security and Public Affairs Chambe of the Supreme Court. The Supreme Court has a total of four Chambres and therefore four Presidents. The European Commission recently published two reports in the field of Justice. The Eurobarometer on Justice in Europe is a survey that seeks to understand citizens’ perceptions of justice within their own countries and the EU as a whole. The survey focuses on the functioning of courts in civil, commercial, administrative and in criminal cases.